The Easter Pig Hops Into Tommy’s Kitchen! The start of a beautiful relationship! It’s my Easter tradition – buying and cooking a genuine Smithfield, Virginia Country Ham. 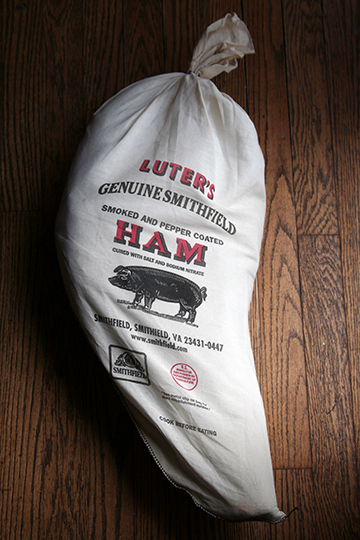 These can be super-salty, as the hams are dry salt-cured, then smoked with hickory and aged up to one year. This is not the kind of ham you cut in a thick chunk, throw on a plate, and serve with some scalloped potatoes. Do you love real ham biscuits? The kind with the slices of super-thin yumminess inside? This recipe is where this ham shines. Most opt to buy their country hams pre-cooked, as it eliminates many of the steps (and days!) to prepare the ham correctly. Although it takes a while, the effort is minimal and the results spectacular. Since the process is daunting to many, I will be talking you through the process in the next few days, with photos, in hopes that you may want to try this yourself – or at least have some of the mystery uncloaked. www.smithfieldhams.com is where I buy my country hams – stop by and take a peek. They sell both cooked and uncooked hams, in various kinds, and are the real thing.